The What: tvONE has begun shipping its complete video-over-IP solution for CORIOmaster video processing systems. 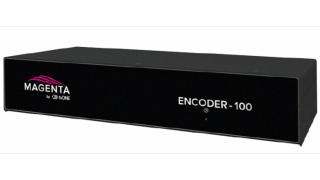 The IP video encoder, Magenta Encoder-100 announced earlier this year, will begin shipping, as well as the new 128GB Streaming Media and 4K Playback Module. Along with the two new hardware additions, tvONE has also upgraded its system design software, CORIOgrapher, to version 2.5. The What Else: Each new 128GB Streaming Media Input and 4K Playback Module provides CORIOmaster systems with the ability to bring two network streams up to 1080p60 at 25Mbs into the system, as well as provide for local playback of 4K UHD or two 1080p60 video files via USB3.0, as well the 128GB high-speed internal solid state drive. The CORIOgrapher software update combines with the new Module, creating a self-contained creative video content ecosystem. The Magenta Encoder-100 automatically pairs with CORIOmaster on IP networks using CORIOdiscover 1.4, included with CORIOgrapher 2.5. The software update allows users to manage Encoder-100 as a source for a streaming media and local 4K content playback. The Bottom Line: Video systems powered by CORIOmaster can now utilize source material from nearly every possible source including video, IP streams and high resolution still images. Full 4K rendering and with 40 Mbs of total bandwidth allows this module to provide high quality content to any video wall and projector edge-blend. To download the latest CORIOgrapher v2.5 software, click here.